This grouping gathers together all versions of the "Social Distortion" album, originally released in 1990, as well as subsequent repressings and bootleg versions. 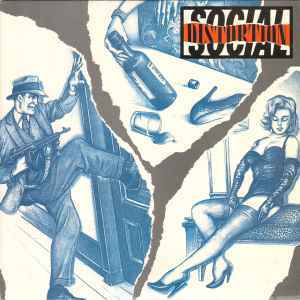 "Social Distortion" is the third and self-titled album by the American punk rock band Social Distortion, released on March 27, 1990, through Epic Records. After touring in support of its previous full-length studio album, Prison Bound (1988), Social Distortion signed with Epic in 1989 and began work on its first album for a major label. The album furthered the rockabilly, blues and country music experimentation of their previous album with songs like "Drug Train" and the radio hit "Ball and Chain". The focus on the alternative rock scene helped bring attention to "Social Distortion". The singles "Story of My Life" and "Ball and Chain" were able to find an audience on alternative rock radio and on MTV. "Social Distortion" was the band's most successful album to date, and their first to enter the Billboard 200; the release peaked at number 128. The album has been certified gold by the RIAA in the United States. Haven't heard an original or the MOV press, but this one sounds really good. The mastering is soooo clean. Not sure if it's an all analog cut though. Worth getting if you need this classic in your collection.